Imagine if you could provide a gift to NA’AMAT that would be everlasting – one that honors or perpetuates the memory of a loved one or demonstrates your heartfelt concern and support for NA’AMAT USA and Israel. HOW DO PLANNED GIFTS HELP? A planned gift to NA’AMAT will enable you to create a legacy and help you to achieve tax and estate goals. Your gift can provide direct funding or general support of the ever evolving needs of NA’AMAT. You can also plan your gift in honor or in memory of a special person in your life. 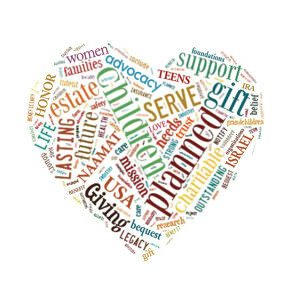 HOW DO YOU AS THE DONOR BENEFIT FROM PLANNED GIVING? Depending on the program you select, you could earn significant tax benefits while making an important contribution to improving the lives of Israeli women, children, and families. Your gift will become a valuable part of your overall financial and estate planning. Some planned gifts are deferred, which means that you commit now to a gift that NA’AMAT USA will receive in the future. Other gifts provide NA’AMAT with needed funds immediately. There are many giving options to suit your goals. A few options are listed below. You can ensure that NA’AMAT will be able to continue its years of service to the Women, Children and Families in Israel who count on supporters around the world to help. BEQUEST – Assign NA’AMAT USA as a beneficiary in your will or living trust. LIFE INSURANCE – Simply designate NA’AMAT USA as a beneficiary of your new or existing policy. Another option is to surrender an existing policy to NA’AMAT USA. SECURITIES – Transfer appreciated stocks or bonds to NA’AMAT USA and receive a donation receipt based on the value of the security on the day it is transferred. TAX-FREE IRA DISTRIBUTIONS – Allows individuals age 70 1/2 to make donations from IRA assets to qualified charitable organizations without incurring a tax on the IRA distribution. INDIVIDUAL RETIREMENT ACCOUNT – One of the simplest ways to give, without changing your will, is by naming NA’AMAT USA as a beneficiary of your retirement account. CHARITABLE REMAINDER TRUST (“CRT”) – with NA’AMAT USA as the beneficiary. CRT provides a payment stream (fixed or variable) to you or your family member(s) for either a term of years or a lifetime. At the end of the term, the remaining balance is given to NA’AMAT as your gift. A CRT can provide significant income, gift and estate tax benefits. CHARITABLE LEAD TRUST (“CLT”) – allows you to experience the rewards of charitable giving during your lifetime. A CLT allows you to contribute to NA’AMAT USA and keep trust assets within your family. Assets transferred to a CLT generate an income stream for NA’AMAT USA during your life time. Upon termination of the CLT (either a term of years or lifetime,) the remaining trust-held assets are transferred to your designated beneficiaries. A CLT can provide significant gift and estate tax and wealth transfer benefits. NA’AMAT USA follows strict ethical standards and treats its donors with respect, integrity, confidentiality, and discretion. 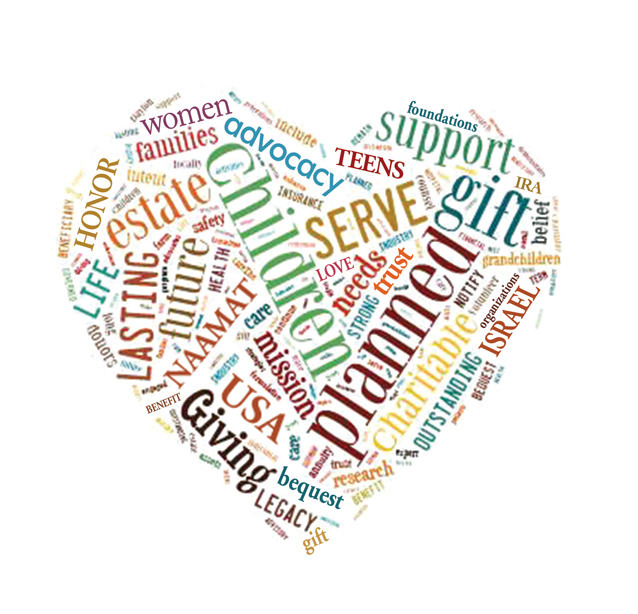 Making a planned donation requires reflection and preparation. NA’AMAT USA recommends that you consult your legal, taxation and financial advisors. Please notify us of any changes to your will, trust or insurance policy naming NA’AMAT USA as a beneficiary.